Among other goals Knowledge Hub has been set up in order to facilitate the management of cultural landscapes, and to support the protection and planning of cultural landscapes. The general public of the Hub represents both main stakeholders as well as the knowledge base of the underlying questions: What is happening with cultural landscapes and how do you perceive these changes, thus representing the focus group of the citizen science aspect in the Hercules project. 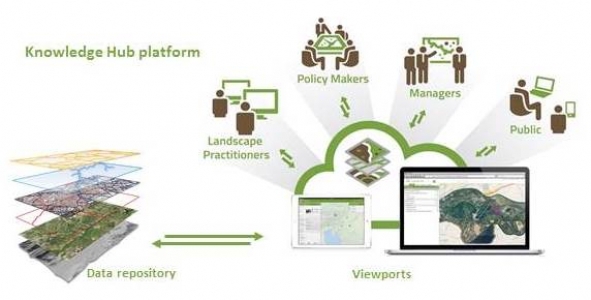 - Knowledge Hub web GIS application, implementing a powerful cloud web GIS editor and viewer with advanced GIS tools, is available at http://kh.hercules-landscapes.eu and is the main access point to the data repository. - Mobile applications, which are use-case-centric, provide means to crowdsource data collection in an organised and simple-to-use way. Since the data model (for the data collection, e.g.) is defined from the web GIS application, the platform allows for fast deployment of new use-case-centric mobile applications. - HERCULES Labs – data explorers, http://labs.kh.hercules-landscapes.eu, have been developed to facilitate showcasing the results to the general (non-GIS-expert) public. Sinergise has recently won the 2016 Copernicus Masters Competition with its path-breaking satellite image web service – the Sentinel Hub. As Sentinel-2 data - a free public dataset from Copernicus' missions - makes it possible to identify different land-uses (e.g. built-up areas, forests, arable land, waters, etc.) and fits well with landscape change observation, we have integrated it into the KH using Sentinel Hub service (http://www.sentinel-hub.com). Primarily targeted to the study landscapes of HERCULES project, users will be able to pinpoint and mark the changes they feel mostly affect the cultural landscapes. Due to the research nature of the overall HERCULES project, the primary focus was to develop the tools to support research activities. Therefore, the future of the Knowledge Hub is first and foremost in research projects. Hopefully there will be similar projects where the Knowledge Hub will continue to serve its purpose, guaranteeing its continuous operation and upgrades for the next several years. If you believe Knowledge Hub would benefit your work, do not hesitate to contact us! The versatility of the web application, adaptability of mobile applications to use-case scenarios and possibility to hide the advanced tools with simple user experience of the Labs make the Knowledge Hub platform an efficient toolkit to collect, archive, use, share and distribute project results to everyone. Sentinel-2 at Knowledge Hub: http://labs.kh.hercules-landscapes.eu/herculesSL/index.html. Figure: Illustration of what is the Knowledge Hub and how it can connect various target audiences.